According to a folk belief widely circulated in Europe, certain persons were capable of transforming themselves into wolves on Christmas Eve. The night itself was filled with innumerable magical possibilities: water became wine; the mandrake root of legendary fame bloomed and apple trees simultaneously bore blossoms and fruit. At this time of year Frau Holda appeared with True Eckart, leading an unruly procession. An encounter with this Christmas goddess and her companion was both terrifying and rewarding. An unsuspecting mortal who unwittingly crossed path with Frau Holda’s procession received that most illusive Christmas gift of all, one that kept on giving. If you were lucky enough to be holding a beer stein when you met up with her, your glass would always be filled with tasty beer. That is, until you unwittingly disclosed the source of your secret brew. The night was also good for augering the future. On Christmas Eve the curious hollowed out 12 onions and filled them with salt. Placing them strategically around the room, each onion was designated as a month of the year. On Christmas morning the onions would be carefully examined and the future predicted according to the shape of each onion. A shriveled January onion could only mean a month of meagerness. Likewise a bloated bulb could only portend a fat and prosperous 30 days. As in most things, it appears that much was left to the imagination of the beholder. But back to the Christmas wolf. The wolf was originally significant as companion to Woton (Southern Germanic tribes) or Odin (Northern Germanic tribes). Two wolves reputedly were always by his side and they behaved more or less like hunting dogs. Because of this connection, the wolf became forever associated with heathen or pagan beliefs. An unbaptised child was referred to as heidenwolf (heathen wolf). There were certain methods one could employ to become a wolf: rubbing your body with magical salve or fastening your buckle in the 9th hole of your belt were popular methods. But remarkably, it was on Christmas Eve when pagan powers were especially potent. Persons with such inclinations could transform themselves into wolves quite easily on this night. Why someone would want to become a wolf is anyone’s guess. The night itself was considered to be imbued with supernatural powers. A wolf in December is a ravenous beast. 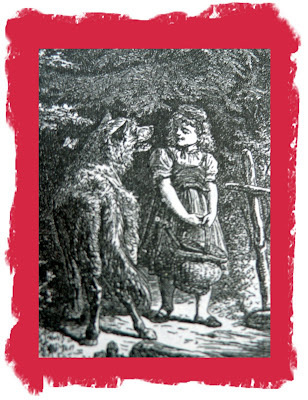 The all-devouring creature in Little Red Riding Hood is juxtaposed with the life-giving nourishment of wine and cake the maid brings her grandmother. In Europe, there is a traditional cake associated with Christmas and the month of December, with many different regional variations. In Germany, this cake is celebrated for its richness and is called Christmas stollen. Other countries also eat a sweet cake, often filled with raisins, nuts or other fruits. Folk tradition stipulates that eating this cake is absolutely necessary, for its richness awards strength and much needed poundage to survive the long winter months. To ward off the ravenous beast within, bake this Christmas stollen and enjoy. Substitute raisins for the dried cherries to bake a more traditional European stollen. Add while kneading:1 3/4 sticks soft butter, the dried fruit/rum mixture, 1/4 cup coarsely chopped and lightly toasted almonds. Roll into log about 6 inches long and 1/2 inch in diameterRemove dough from bowl and lightly roll out to a 1-inch thick oval (roughly 14 x 9 inches). Place nut log in center. Fold over and shape into loaf. Brush loaf with 1 tablespoon melted butter. Place on greased cookie sheet. Preheat oven to 350 F. Using sharp knife, cut 3 cross-shaped notches across top of loaf. Let rise until double in size. Bake stollen for about 50 minutes or when knife inserted in center comes out clean. Brush with 1 tablespoon melted butter. Top with powdered sugar.